The Whitechuck Glacier supplies flow to the headwaters of the Whitechuck River. Its white expanse has graced these headwaters for thousands of years. The Whitechuck Glacier retreated slowly from its advanced Little Ice Age position until 1930, while rapidly thinning. Thus, prepared it began a rapid retreat in 1930. 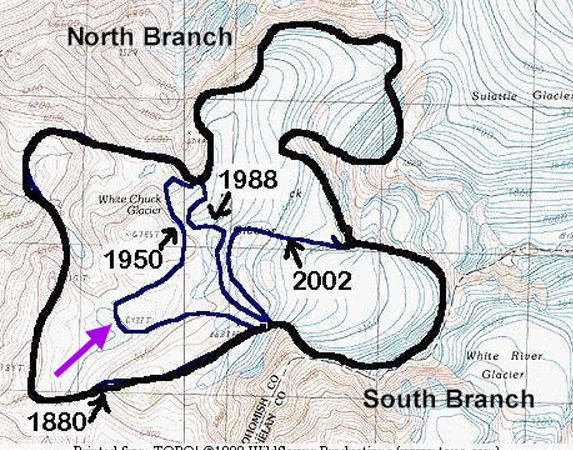 This rapid retreat culminated in the total disappearance of the north branch of the glacier in 2001. No more does this glacier dominate the headwaters, and its demise has and will continue to alter the hydrology of the Whitechuck River headwaters. 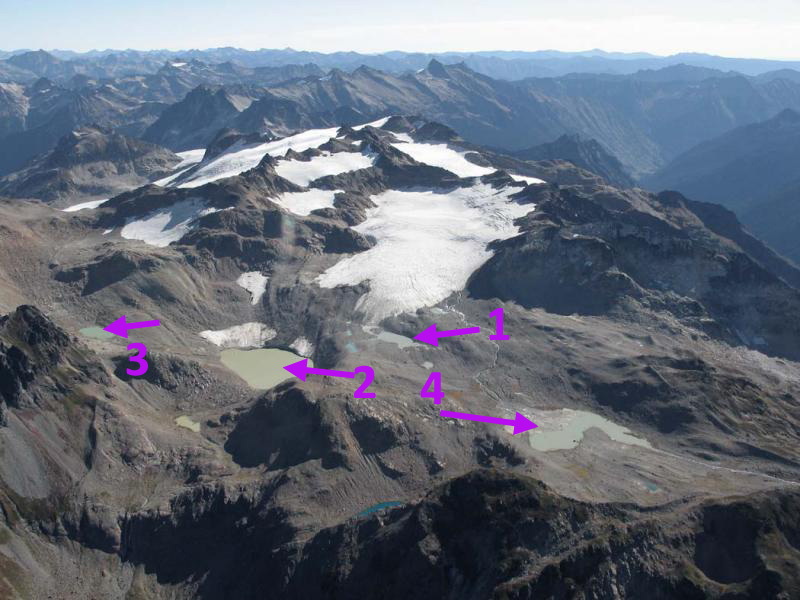 How did this glacier die and what are the impacts when a glacier disappears? This is the glacier that also led to the first glacier survival forecast model. A progressive temperature rise from the 1880’s to the 1940’s led to ubiquitous retreat of North Cascade glaciers. 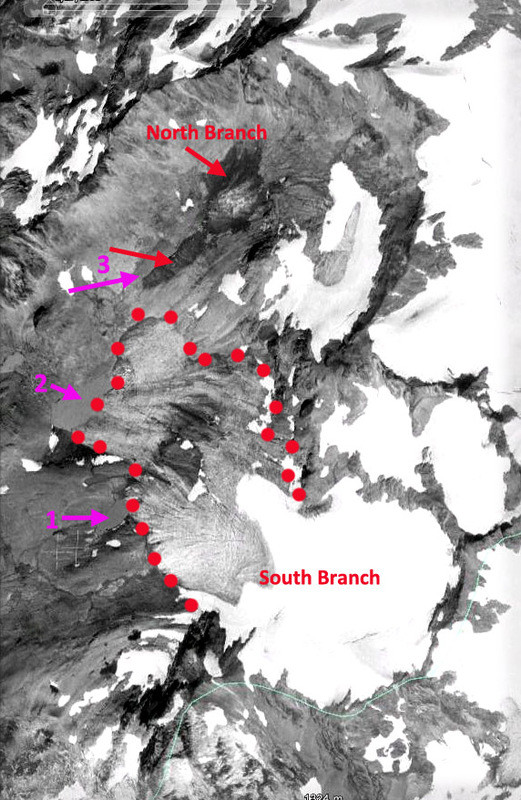 The Whitechuck Glacier was no exception: by 1950 the glacier’s northern terminus had retreated 1050 m and the southern terminus 750 m. More importantly the glacier had thinned dramatically. The glacier had flowed down relatively gentle slopes into a large flat basin. The 1967 aerial photograph of the area from Austin Post, USGS indicates the two merged branches of the glacier North Branch (NB) and south Branch (SB), note the lack of snowcover on the North Branch (Figure 1). The USGS topographic maps of Glacier Peak from 1958 show the still large Whitechuck Glacier with an area of 3.1 km2 (Post et al., 1971). The USGS remapped the area based on aerial photographs from 1983.and this map still has two branches with two termini, the northern branch feeding the northern terminus, and the southern branch feeding both the northern and southern terminus. Both branches exceeded a mile in length in the 1950’s (Figure 2). The 1984 the USGS maps of the East Glacier Peak and West Glacier Peak quadrangles indicate the southern terminus had retreated 450 m, from the 1958 map terminus position. 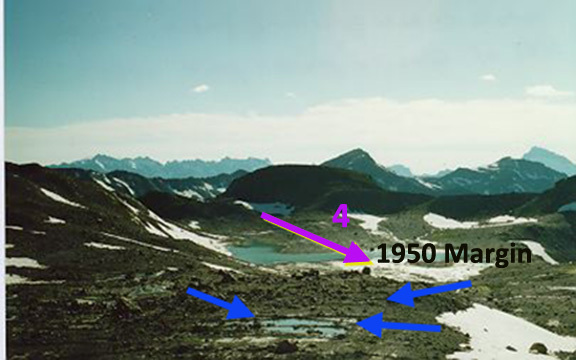 The northern terminus had retreated 180 m and was still near the lip of a basin at 1975 m. In 1988 during our field visit the southern terminus of the glacier ended in a new lake #1 at 2020 m (Figure 3). The lake is not in evidence on the 1984 updated USGS topographic maps or in 1979 aerial photographs of the area. The terminus had retreated 510 m since 1955, and 140 m since 1967. The lake that had been the terminus location in the 1958 map still exists, but is now 375 m from the edge of the new terminal lake, and has recessional moraines evident (Figure 4). 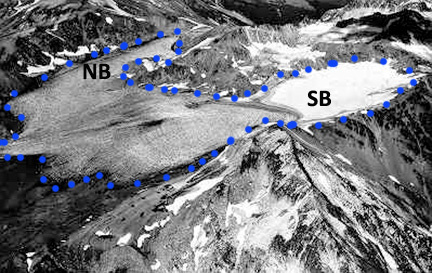 The south branch of the glacier is thin and stagnant in the lower 200 m. Above this point crevasses are in evidence and the convex profile indicates that the south branch was still an active glacier in 1988. 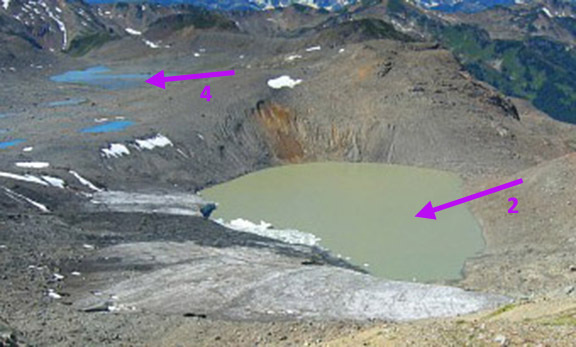 This remains the case in 2005, while in the former location of the north Branch several small lakes are evident where the glacier used to be. 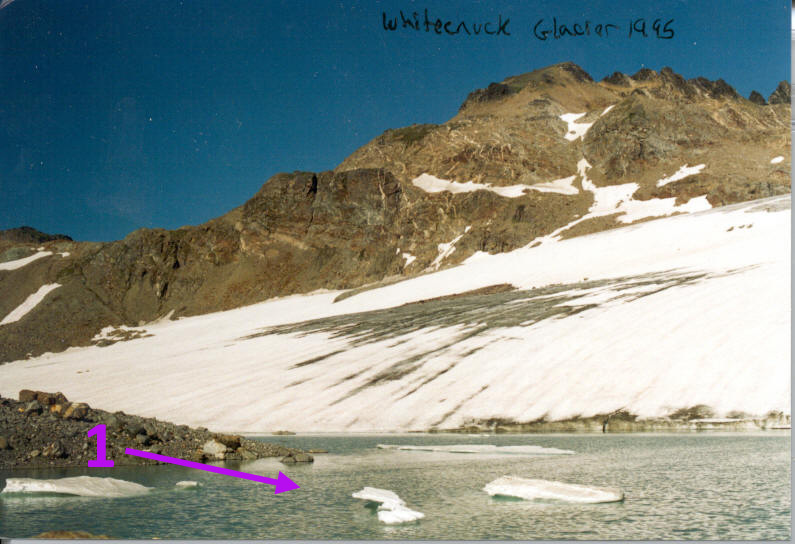 The northern terminus of the Whitechuck Glacier ends in a lake basin at 1980 m in 1988. This basin was filled with glacier ice in 1967. In 1988, the new lake was 210 m long and still expanding. 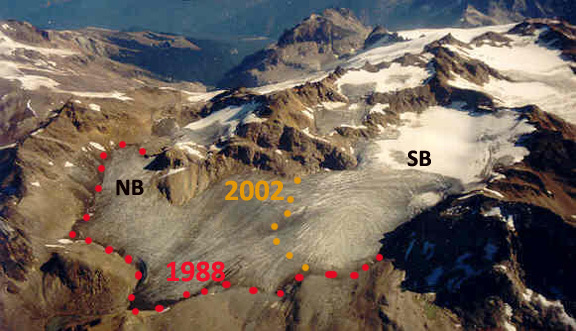 Total retreat of the terminus from 1955-1988 was 410 m. The northern half of Whitechuck Glacier extending up to Glacier Gap was a rapidly melting, concave, stagnant ice mass in 1988. The north branch had no crevassing and even the ice at the glacier surface lacks the normal blue ice color of glacier ice. Instead it was a dull dark grey color. 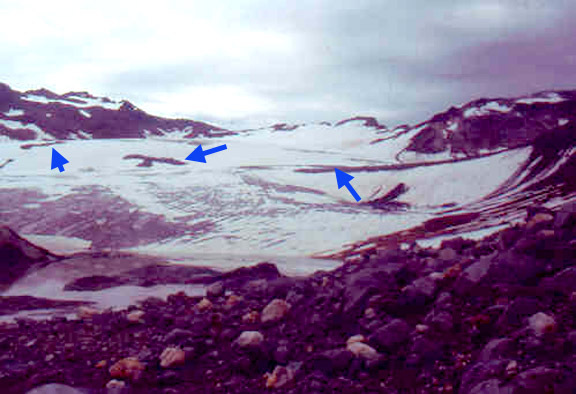 The distance from the terminus to the top of this section of glacier is 1550 m. Total glacier area has decreased from 3.1 km2 in 1958 to 1.8 km2 in 1988 (Figure 5). 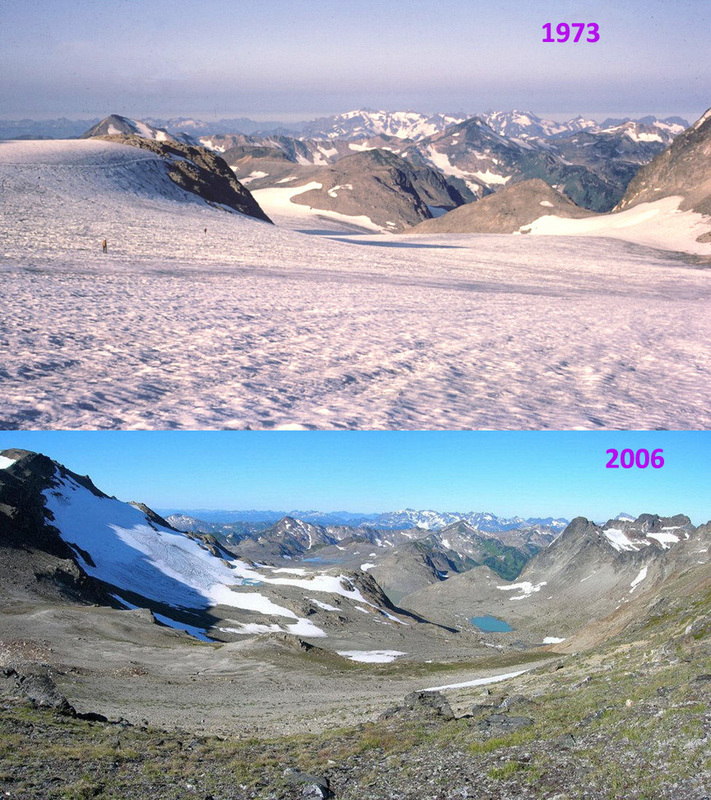 In 2002, the northern branch of the glacier was entirely gone. Instead of an ice filled valley extending 1.6 km from the lake to Glacier Gap at the former head of the glacier, there was a boulder-filled basin. 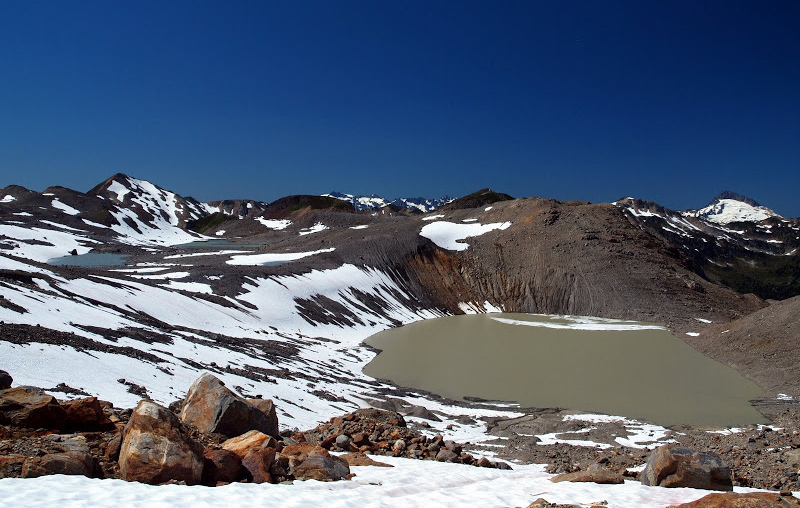 There is a new lake #3 that has developed at 2000 m, 400 m northeast of the terminus lake #2. The walk to Glacier Gap took much longer picking our way through the loose bouldery terrain. The largest and deepest is Lake #2 this is where the two glaciers used to intersect. 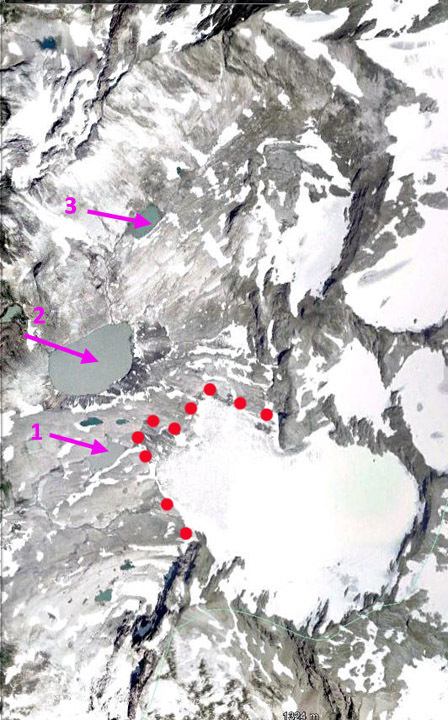 A 2006 Google Earth view illustrates the glacier extent down to 0.7 km2 in 2006 from 3.1 km2 in 1958 (Figure 10and 11) . The retreat of this one glacier has led to the development of six new lakes, three in the last thirty years. By 2010 the relict ice around lake #2 was gone (Figure 12). The 3.4 km2 of new bare bouldery surface can be slowly colonized by vegetation. Compared to many areas of glacial retreat where natural revegetation takes place fairly rapidly, there it is an achingly slow process, where even the portions of the basin exposed for fifty years have gained little colonizing vegetation. This may be because of the extremely limited growing season (the basin still has snowcover into July), and its relative isolation from seed sources. The loss of area has impacted glacier biota, such as ice worms, springtails, algae, bacteria, and other invertebrates and microbial organisms living on and in under these glaciers. This represents a substantial loss in biological processing and material that would otherwise be transferred downstream. The amount of runoff entering the Whitechuck River has declined substantially in the summer. For thousands of years each square meter of glacier has contributed 800 gallons of runoff from July I-October 1. With the loss of glacier ice, this contribution should drop by 65-80% based on observations at two other sites where glaciers have disappeared (Pelto, 1993 & 2008). The change since 1950 in glacier area has reduced summer glacier runoff by 1.5 billion gallons annually. This represents a loss of between 20 and 25 cfs for the Whitechuck River during the July-September period. The water will also be less sediment laden and warmer. The impact will be less water for the fall salmon runs, and less food in amount and processing for stream invertebrates on which salmon feed downstream in the Sauk and Skagit Rivers. This mirrors the change in the Skykomish River Basin (Pelto, 2010). Two of the field visits to this area were with the late Cliff Hedlund, Corvallis, OR who did in fact sew his own gear. 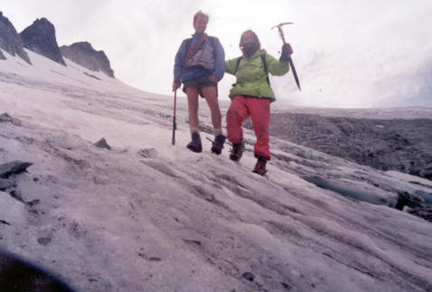 This entry was posted in Glacier Observations and tagged Death of a glacier, glacier disappears, glacier loss, global warming glacier loss, Whitechuck Glacier. Bookmark the permalink.